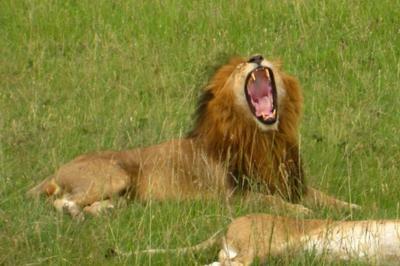 I wanted to see lions more than anything in Masai Mara and luckily i spotted them when even the tour guide didn't. I will never forget this trip. It was the best and the lion roaring made it even more awesome. LOVE AFRICA! Please have a look at my www.kenya-beachrentals.com website where you will see your photograph on the opening page and also on the safari page. Thanks for letting me include it. What a fantastic photograph! To capture a moment like that is such a rarity. Congratulations to Anna on doing that and I'm sure pictures like these will encourage a lot of people to come and explore what a wonderful place the masai mara really is. Way to go! Chris, it would be an honor for me if you include my picture on your website :) If my picture convinces other people to visit this beautiful land, it would mean a lot to me. John and Chris have given you the accolade you deserve, to capture that moment is wonderful and you deserve so much credit and I do hope that you will get it across the world. So many times we hope for the best picture and so many times we are disappointed but you have captured it and well done from me. I think its a Fabulous photo. and its good evidence that you can get Great pictures with a good camera even if it's not a Professional model. I have never seen a better photograph of a lion in full roar. I would of course acknowledge the source of the photograph.